Hops growers in the South Atlantic face stiff competition from large, well-established farms in northern parts of the country, but more and more are finding profitable markets beyond breweries. 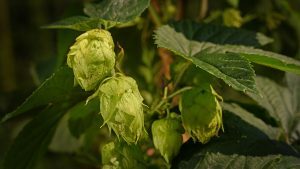 Farmers and others who want to learn more are encouraged to attend the 2019 South Atlantic Hops Conference, organized by NC State Extension’s Jeanine Davis. The conference takes place on Saint Patrick’s Day weekend, March 16-17, in Asheville, North Carolina. This year’s conference features two tracks – one for aspiring, beginning and experienced farmers, and the other for those who want to explore alternative uses and markets, ranging from herbal medicines to wedding decorations. Beyond beer: Alternative uses and markets for hops get attention as Extension hops conference enters its fourth year. Other opportunities that will be discussed include adding new crops, such as vegetables and herbs; selling to home brewers and to restaurants; opening on-farm breweries; adding value to the crop by selling whole dried hops or floral extracts; and more. Those who register for the conference by using this special link at https://go.ncsu.edu/sahc2019 will get a 10 percent discount on the $220 conference fee. The discounted ticket will be displayed in the tickets section. Partners for the conference include the hops program at Virginia Tech and the Old Dominion Hops Cooperative. Make plans now to attend the JC Raulston Arboretum’s 25th annual spring garden party and plant auction on May 5.